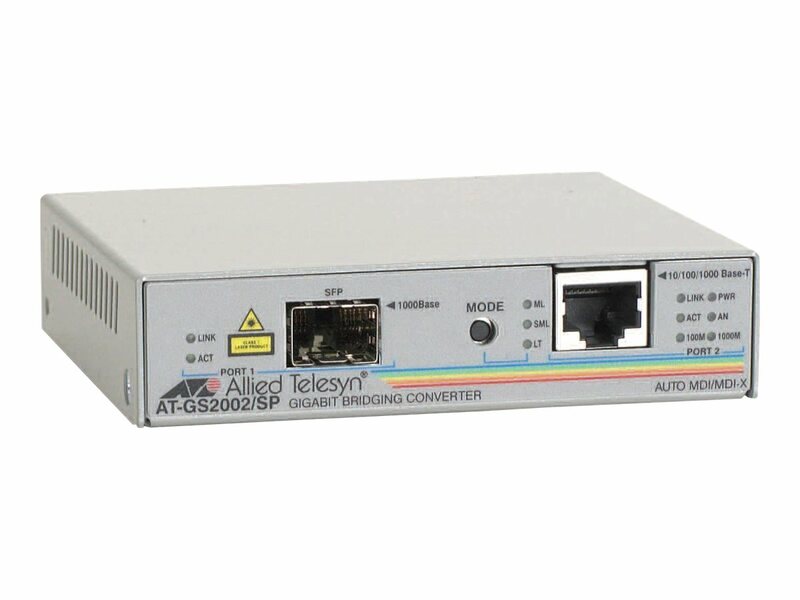 The AT-GS2002/SP Ethernet bridging converters are designed to extend the distance of your network by interconnecting LAN devices that are physically separated by large distances. These bridging converters have the functionality to connect any managed/unmanaged 10Mbps, 100Mbps, or 1000Mbps (1Gbps) switch or hub using standard 10/100/1000T RJ-45 connections and convert the electrical signal to fiber optical signal via its SFP port. Each AT-GS2002/SP bridging converter features a 10/100/1000T twisted pair port and an SFP port. The twisted pair port has an RJ-45 connector and a maximum operating distance of 100 meters (328 feet). These units can operate at half- and full-duplex. Each small bridging converter is powered by an external power supply unit for use in standalone applications. Where multiple media converters are used, up to 12 standalone devices can be inserted into a low-cost AT-MCR12 rack-mount chassis, allowing all the converters to be powered by a single internal power supply. In critical applications, a second load sharing internal power supply can be installed into the rack-mount chassis.